Do you ever follow those people on Twitter who don’t have their personal photos? Let’s be honest. Normally we don’t like following people we don’t know or at least have a picture of their personality on their profiles. That little default photo that Twitter supplies is okay. However, experience has shown me that 99% of the accounts that don’t have a picture belong to spammers and robot accounts–not the kind of “people” we want to include in our social network. So, if you don’t have a picture for your Twitter profile, I’m may not be following you. And I’m not alone. You look suspicious. You don’t appear to be interest in participating. You bear a strange resemblance to a spambot. That’s not your best look. But you can do better than that. If you don’t have a picture up yet, get into your Twitter profile and upload one now. If for some reason, you really don’t want to have a picture of yourself publicized in the Twitter universe, find a stock photo of a cedar tree on a summer day or a cute kitten or even a boat by the lakeshore. Allow something in your profile to describe you as a real person. That there is a real person behind the tweets. You owe it to yourself really to upload a photo describing you as person in Twitter. Bottom line, your picture is worth a thousand followers in Twitter. Find out more about “How to Follow Friends and Tweet People” and increase your following. The real value of using Twitter may not be so obvious. Twitter is both a social networking site and a micro-blogging tool. And there is a prevailing set of norms governing the use of Twitter. These norms are created to conform to the expectations of the user base. If you’ve just started using Twitter, you may find it difficult to develop a sense of what is the optimal way to use your newfound Tweeting power. In Twitter, there is that culture and particular way of doing things. Getting into the flow of Twitter and learning the rhythm of the site may not always come easy to beginners. Here’s one way around this problem: Follow a few people who have big follower bases and watch them for awhile. Learn how they use Twitter and recognize the techniques they use to be a real voice in the conversation. If you watch a few of the “big boys” doing their thing, you’ll soon figure out how you might be able to use the site effectively in order to meet your online goals. Learning from the best and from the most experienced is always a working strategy. When applied to the workings of the Twitter land, this indeed works very well. Therefore, choose those you follow so you can learn best. Check our more insights by getting this free resource about using Twitter. If you’ve tried Twitter at all, you must have known that there are so many different ways to get Twitter followers. You can follow everyone and hope that enough of them will reciprocate. That’s somehow a desperate way to boost your follower total on the Twitter stratosphere. Or you can make a concerted effort to promote your Twitter URL at every turn, hoping to find new followers from the anyone that visits your website or blog. There’s a cooler way to do it. This third strategy by the way is clearly the one that works the best. If you give quality tweets – you’ll get followers. Followers of good quality. The kind who want to listen to what you say and who are also willing to follow your advice. Start tweeting the “good stuff”. This way people will notice. Then they will re-tweet you. They will recommend you to their followers. They will respond to you in a positive way. People become aware of your presence in Twitter because you are doing something special. Do you want to find a large collection of rabid twitter followers who can actually produce results in your marketing? There’s only one sure way to do it: Drop great Tweets. Want people to notice you on twitter? Give updates to the twitter question “What are you doing?” like what a live human being does. That’s the only to attract the other person. That works anywhere in life. 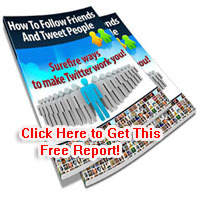 Click this link “How to Follow Friends and Tweet People” to find twitter followers with quality. If you’re in the internet marketing business, you should know something important about the average Twitter user. The run-of-the-mill member of the Twitter community doesn’t like you very much. Sorry, but it’s true. And who can blame those folks for feeling that way? They’ve seen their completely legitimate, commerce-free social networking venue attacked by some of the lousiest spammers in history. Inside twitter, you can find direct messages featuring affiliate links. You have the robot accounts that work around the clock pounding anyone who was silly enough to follow with link after link after link. You have goons who self-promote to the point of nausea, balancing self-congratulatory Tweets with their sales page links. The bad list goes on. So, unless you’re marketing to other marketers via Twitter, you are going to have to come up with a much better and far more trustworthy approach than the spammers and clowns that have already started to poison the cool Twitter environment. That’s the bad news. The good news is that it’s very possible to do just the opposite. If you’re using Twitter the “right” way, you can overcome a built-in bias against internet marketers. Find out the right way of marketing with Twitter. Inside Twitter, there are a few great ways to build your followers. Creating great tweets can build your following. Or even by just following other tweeterers can increase your twitter followers. This is because some are just programmed to follow those who follow them. However, if you’re really serious in the follower department, you may need to take your game off the Twitter site. Below are a few off-Twitter strategies you can use to promote your Twitter URL in order to boost your follower count. First, in the emails you’re sending to your subscriber list, include your Twitter URL in the footer. This only takes a second of your time yet it can make a huge difference. Business contacts who participate in Twitter are likely to follow you and others may do likewise. Second, if your participate in any forums, make sure you include your Twitter URL in your forum signatures. Add also that URL to your profile. Third, be certain that you’re indicating your Twitter involvement on all of your other Web properties. That means you need to have your badge up on your blog and on all your static sites. The more you can do to spread the word, the better. If you want to maximize your twitter follower potential, take advantage of every opportunity that is available to you.